however, i do not have time to fret about my exotic looking fringe, for i have critters and children to sort. upon my pottling around the shed with 'post-it' reminders stuck to my chest i noted my daffs are looking peachy and springy. i am wondering if they will still be there upon my return, looking not so peachy and not so springy, it is kind of comforting to think they may well be... things like that make one feel like life may whizz on by some days and be a little surreal, but the things which matter most like family and their little habits, stay the same. yes it is quite true to say, i hope i do arrive home to find my daffs bedraggled and way past their best on the windowsill. gosh blimey i am getting all melancholy on you dearest readers, i guess that happens from time to time especially when i am flying on my own. 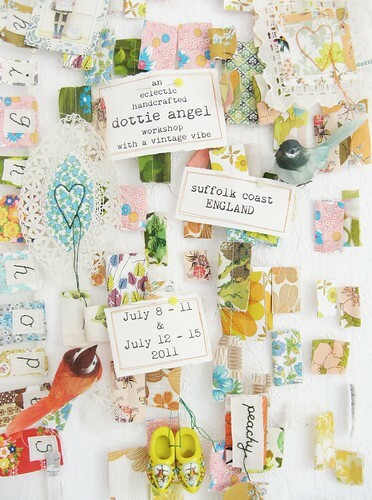 let us move on from such thoughts and before i head off on my red eye to old blighty this may be the perfect time for me to mention my up and coming workshops on the beautiful Suffolk Coast in England, this summer. "Tif, why would you chose to cut your fringe with kitchen scissors the morning of leaving to visit England and meeting all those lovelies you have lined up?" "Tif, instead of darning three pairs of tights in their heels and leaving it to the last moment, do you not think a trip such as this is worthy of a new pair of tights?" "Tif, when will you be getting your derriere into gear and making summer apron wraps for your little shop?" then may i suggest you do not send those to Angela because i am quite sure she does not wish to talk about my exotic fringe shape, nor my darned socks and quite possibly not my derriere. however the little bit about the apron wraps, may i be so bold as to answer here and now since you asked so nicely. for indeed upon my return from recharging my british batteries, i have plans, big plans which involve me, my ever-so-lovely Miss Ethel and dottie angel's newly adopted auntie and her trusty sewing machine. together we will beaver like we have never beavered before and after we are all 'beavered out' i hope to have summer apron wraps, lovely high hope flags and little sunshine sacks hanging in the shop window ready to meet Mr Spring and Master Summer. Oh Tif, have the most fabulous time! I cannot tell you how wonderful it would be to join you and Angela again this summer if I weren't going to be so very far along with the baby. Imagine at the beach! In England! Oh my. Your dearies will be in for a time of the most very peachy kind. Do have a lovely time recharging! We look forward to your safe return. I have always used my trusty embroidery scissors, they are so sharp. However, I'm currently letting my hair grow....and we'll see how long that lasts this year! 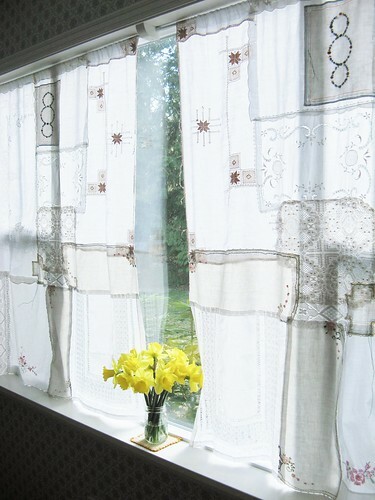 P.S I like your curtains in the pic with the daffodils. Haha, you should have waited for my scissors Tif! I'm sure we'll sort it out when you're back again. Have a great time there across the pond! Dear Tif... you're so cute and clever! I hope you have a wonderful trip to England and be safe and take lots of photos! I'll miss you while you're gone! it delights me that you boldly use words like "fringe" without babysitting your american readers by adding "bangs" in brackets. Have a splendid trip to 'ole Blighty' we are here awaiting your arrival!! My kitten girls booboo and roobarb are often seen sitting on my little collection of fabrics.... I wonder do they wish that they had thumbs so that they rustle up a little quilt!! Wishing you a truly gleeful trip! I always think the best and worst thing about a fringe is that it can grow back very, very quickly. :) have a beautiful trip! I have a fabulous idea for you: plan a workshop on the lovely central coast of California! I so badly want to attend but England is a long swim from here. I think the sun will keep his hat on and await your imminent arrival. good trip! look forward to hearing all about it and seeing photos! So jealous of the lucky ones who get to go to England for your workshop! I am looking forward to one closer to home! Have fun, new fringe and all! Tiff, if I lived close by I would indeed be one of the dearies visiting your workshop in England!!! Any chance of coming to Melbourne!! I too cut my fringe (bangs) on the oddest of occasions! It is fun - and then - oh - not so fun when you realise it is not perhaps the sportiest of fashionable sense! You are probably aware that their cousins here are all poking their petals out at the sun (yes, the sun)! have a great crafty break and fill those batteries...we will be waiting ! i hope you have a wonderful trip! have loads of fun. and i must say, i just looooove your curtains! are they vintage pillowcases? They are beautiful. Good luck on your endevours! Oh Tif! Kitchen scissors are VERY dangerous things and should NEVER be picked up in times of rush! I know it's happened to me, I took to pinning my bedraggled fringe back till it grew out, and let me tell you that took ages! So many very exciting things falling into place for you...I'm glad we all get to come along for the ride! Have a great trip!! LOVE your site ;) ;) ;) I'll be visiting often! Fresh inspiration and color abounds! Thank you for the rainy day boost. Come visit 2nd Saturdayz Urban Market when your home! I love your creative blog!!! Hello :] I really like this blog ^^ Um,my sister and i are new with all this,sooo we'r still figuring all out XD Have a great day! No matter how many times my hairdresser reminds me I can come back for a fringe trim, I still end up cutting it myself and regretting it after! Good to know it isn't only me! Super cute blog and I love your crafty goodies! Have a lovely trip!! In visiting your perfectly wonderful blog I find myself so refreshed and happy...dare I say that sweet things of all kinds tend to have that affect on me...sincerely, thank you for being a dear sweet thing! old blighty was perfectly perfect and my british batteries have been nicely charge!